Chapter 7, “Early Leaders.” Again, if you’re a CEO or business owner don’t skip over this thinking, “This doesn’t apply to me. I’m not an early leader.” You’ve got early leaders on your team. Challenge yourself to become a better leader. Serve early leaders well. Early leaders tend to be immersed in mastering the basics of their job responsibilities, understanding the dynamics of their organizations and demonstrating the capability to lead groups to deliver results. As they develop their outside insight resources, they have two primary things to consider: a) they have to learn to develop a few key advisory relationships (to begin to get regular doses of a third opinion) and b) they have to lay the groundwork for their long-term leadership circles. For advisory relationships, the objectives are to find expertise, develop your capacity to apply critical thinking, break through real and perceived mental barriers and to accelerate your own development from the experiences of others. Developing these relationships should be done in the context of daily work in order to elevate your performance. It’s about making full use of the third opinion. Companies reward those who deliver results. The ability to sort through information, form assumptions, test them, and then communicate an opinion and offer direction are critical leadership skills that are the foundation of expert thinking. Exponential thinking goes one level beyond. You look for hidden assumptions, attempt to disprove (instead of prove) hypotheses, actively seek out data points that don’t fit, and analyze trade-off and risk. The author provides an extensive series of questions designed to help early leaders improve their exponential thinking. The skills are difficult to develop alone. You need thinking partners. It’s never too early to develop the habit of listening in order to learn from others. Again, the author provides a series of questions every early leader can ask themselves to improve this skill. It’s about learning to integrate multiple perspectives to improve your thinking. Feedback is critical in helping you close the gap between reality and your perceptions. Ms. Joni mentions the various circles where thinking partners might be found for an early leader: corporate contacts, academics, trade associations (or trade shows), partners/alliances, job search contacts, alumni networks, and nonprofit activities/nonwork organizations. Joni suggests seeking out thinking partners with a few people on specific issues. Keep it tight, narrow and focused. Be careful about advice, “Here’s what you should do,” and instead seek deeper conversations that broaden your perspective. She appropriately mentions that you should look to give as a thinking partner to somebody else. (Note: She doesn’t spend near enough time on this in my opinion. The book is mostly a what’s in it for me approach, but that’s understandable since she’s urging leaders to incorporate these things into their life – and it’s a hard sell to urge most people to improve with a different approach.) There’s a lot of learning to be accomplished when we’re helping others though and it’s good to be reminded of that fact. The chapter ends with a deep dive using her Star Of Complexity Map approach to developing the skill to apply insight that drives results. Illustrated with stories, Joni has many questions and diagrams to help the reader better understand her suggested approach. The word “complexity” is appropriate because I find this material worthwhile, but overly complex for my tastes. However, some leaders may find such an approach very helpful so give it a go. Chapter 8 is entitled, “Key Leaders.” This chapter does for these leaders what chapter 7 did for early leaders. 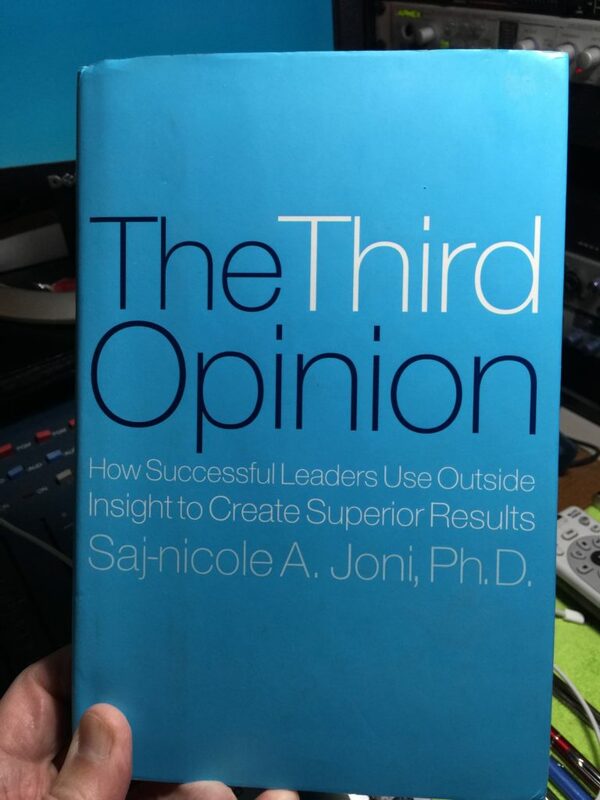 And chapter 9 is “Senior Leaders,” likewise giving advice on how senior leaders can seek and find their third opinion. There are distinct differences. I’d summarize the major differences in two areas (there are others): safety/security and expert thinking. That is, we need a safe group of peers who have no vested interest in who we are (our role or job title has no impact on them), but who can be trusted. Peers with whom we can let our hair down and be vulnerable, and who will be that way with us. Reciprocal behavior in such a group is key. Key leaders would not be well served being surrounded by senior leaders. That’s not to say senior leaders can’t serve key leaders. They surely do (and should). But we need to be surrounded by a diverse group of people who can relate to and understand us – and others we can relate to, and understand. Admittedly, being intentional about this can grow increasingly more difficult the higher we climb the leadership ladder. Hence, the adage, “It’s lonely at the top.” But if we develop the skills to seek and find the third opinion early in our careers, we can be quite proficient later on as our career advances. Only if there is an alternative can you have a choice; make a decision for better or worse, and that will only be possible if an opposite opinion is expressed. It is like gold; you can’t tell whether gold is pure unless you strike it against another piece of gold. People who have a stake in your leadership (stop and consider the scope and scale of all these people) and who care about your leadership don’t want you to go it alone! You impact many people. People have a big stake in the success of their leaders. This is also true of family and friends of leaders. These people see and experience how isolating leadership can be…and the toll it can take in the personal lives of leaders. Every leader’s inner circle includes these people, but there is a limit to their expertise and perspective. Ms. Joni confesses that she began her research to improve the decision making capability of business leaders today. She found that it’s not limited to business though. It impacts every phase of a leader’s life. Exponential thinking isn’t restricted to business challenges. I hope you enjoyed this glimpse into THE THIRD OPINION by Dr. Joni. I realize that leaders who find no value in diverse thinking or exponential thinking will likely never take a peak inside. But those folks clearly are not my audience. Grow Great dot com isn’t aimed for the comfortable leader uninterested in growth, improvement or transformation. And only the courageous leaders will be willing to go to the uncomfortable places required for growth. I hope you’re a leader seeking the appropriate and safe challenges that will propel your career, your business and your life forward. I’m fond of how Dr. Henry Cloud couches vulnerability. Finding safety and security in an inner circle is a major component of all this. Dr. Cloud uses the word “careless.” Not in the sense of behaving carelessly, but in the sense of not having to filter or self-edit. When you’re in a circle where you can speak freely because you know nothing you say will be used against you, then you’ve found a safe space. A safe relationship. A relationship where others have your back and you’ve got their back. A place where you’re both trying to grow, improve and transform. A place where you’re both working hard to grow great. That’s the point.